Russia's Ministry of Defense is preparing to roll out cutting-edge robots and drones for both military and civilian use during an upcoming exhibition in the Moscow Region. A variety of unmanned vehicles, capable of operating in any environment, will be up for display this June at the "Army-2015" exhibition. Some are already seeing wide use, both military and civilian, while other are fresh off the drawing board. The tried and trusted exhibits include the ‘Uran-6’ (Uranus-6) minesweeper robot, which saw use clearing the fields of the Chechen republic of old explosives, and the firefighting ‘Uran-14’. The navy will also be showing off its latest robotics, featuring unmanned armed boats, remote-controlled submersibles, as well as equipment for search-and-rescue operations. Likely taking the center stage will be flying drones. The Russian army already employs UAVs (unmanned aerial vehicles) in most of its exercises and scouting missions. Creating new military UAVs "is one of the priority development routes for the Russian armed forces," the ‘Army-2015’ press release states. The Defense Ministry has developed a complex program to create and introduce new robotics technology, spanning the next 10 years. 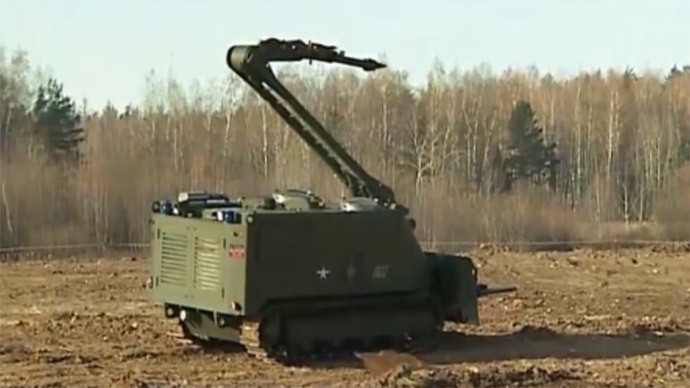 The first mass-produced military robots were issued to the Russian army and fleet in late 2014. The high-tech exhibits won't be limited to robots. "The forum will have 50 thematic sections,"military science committee representative General Lieutenant Stanislav Suvorov said at a media briefing. Russia's leading military science institutions will unveil the most high-tech aspects of the army, like aerospace defense, biotechnologies, lasers, geoinformation complexes and navigation equipment. "One section will be dedicated to non-traditional weaponry," Suvorov told the media. This includes microwave, laser and kinetic weapons, as well as non-lethal armaments and means of information warfare. The Defense ministry expects to use the exhibition to summarize the experience the Russian troops gained over their two-year presence in the Arctic. A separate section will be dedicated to national security in the Polar area. "This mostly concerns the specifics of working in extreme cold and providing medical care in the Arctic," Suvorov said. Overall, the exhibition aims at displaying over 5,000 items and host about 10,000 participants, including all branches of the Russian army and military scientists. "We are ready to review any proposals that show promise for future use in the Armed Forces," Suvorov said. The expo is scheduled for June 16-19 at the Patriot Culture and Leisure Park in Kubinka, Moscow Region. It will span over 40,000 sq meters of pavilions and 100,000 sq meters of open space.